In a “I can’t believe this hasn’t happened sooner” surprise, it looks like we may be getting a HD collection of last gen’s award winning Batman: Arkham Asylum and Batman: Arkham City pretty soon. This comes from a leak from a GameStop employee who sent a picture to the Eurogamer website announcing the yet to be unveiled collection. Though missing the WB Games Montreal developed Batman: Arkham Origins and Armature developed Batman: Arkham Origins Blackgate (guess they have to save something for a sequel, right? 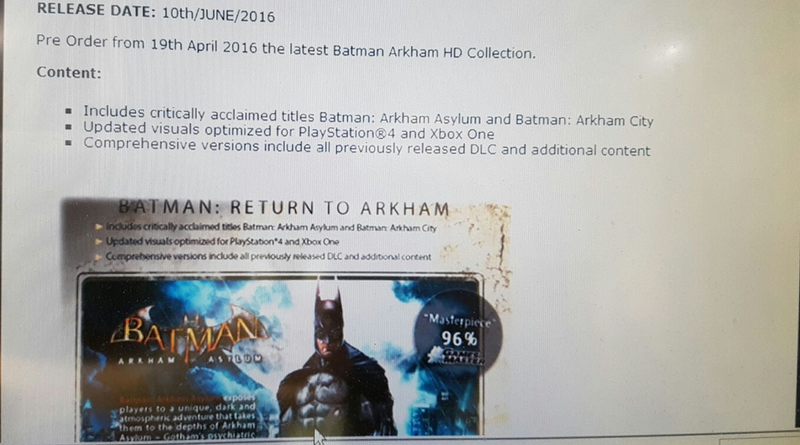 ), the collection will include both Arkham Asylum and City as well as all their respective downloadable content. Should this rumor turn out to be fact, which it most certainly will be, the collection will arrive on June 10th for both the PS4 and Xbox One.